One of my friends who is not yet a member of photomacrography.net has an interesting design for a bellows diffuser that he asked me to share with the forum. The pictures and most of the description are his; any errors in the post are mine. I promised I would show you the Chinese Lantern Diffuser. It is a simple 8 inch cylinder paper lantern, $3.50. I cut out the bottom and added a 1/4 inch thick ring made out of steel and powder coated flat black. I used some para-cord and a cord cinch to handle attaching it to the camera. This is about as simple as it gets. It follows the camera and lens up and down. This one has a full stroke of 15 inches. I am working on a nylon version that is 10 inches in dia with a 20 inch throw. You just point a couple of 430 EX flashes at it and it's done. This is not very sophisticated but it is easy to build and works real well. Please feel free to share this idea with your friends. Here is the diffuser in place. The black lump on the camera is a Canon ST-E2 Speedlite Transmitter. Flash units are not shown. 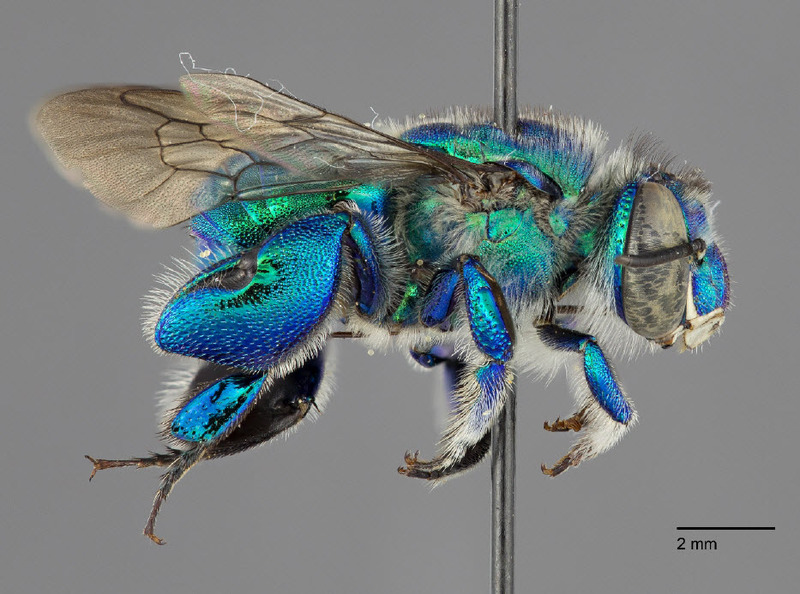 Below, a sample image made using it with a highly reflective subject (orchid bee). Canon 6D, 100mm Macro at 1:1. Here a specimen has been secured on a glass slide with a small ball of dental wax. The slide is placed on a clear table with a photo gray card beneath it. This will give a soft neutral background. Next the bellows is placed over the specimen with its weighted base on the table top. The attaching cord is fully extended. Here is another view of the bellows diffuser ready to be attached to the camera. Finally, pull the diffuser up so that the lens enters the hole on the top. Secure by tightening the straps over the camera, as shown in the first image above. Just point the flashes in the general direction of the diffuser and you will have a nice soft fill light. Simply brilliant. Way to go, Roy! 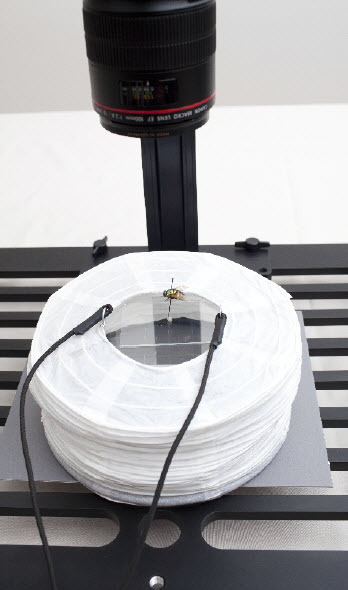 Roy's approach would permit both quick, diffuse lighting, and easy access to the specimen. This is similar to what the Leica FlexiDome provides, at a tiny fraction of the cost. This is particularly interesting to me because I've spent some hours trying to think up an inexpensive alternative to the FlexiDome--not much for my own work, but because I think a lot of other people would benefit from it. The folks documenting large collections of insects, for example, would be prime beneficiaries. But I never came up with any useful ideas. I'd be proud to have come up with something as elegant and practical as Roy has. Please tell us more about the nylon version.